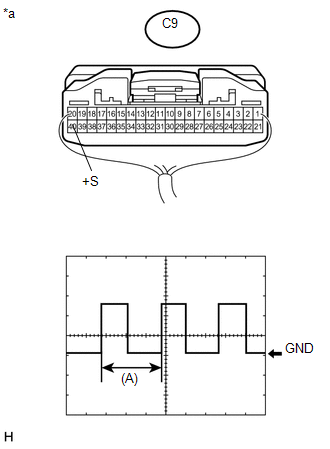 The navigation receiver assembly stores this DTC when the difference between the speed information that the navigation antenna assembly receives and the SPD pulse received from the combination meter assembly becomes large. A voltage of 12 V or 5 V is output from each ECU and then input to the combination meter assembly. The signal is changed to a pulse signal at the transistor in the combination meter assembly. Each ECU controls the respective systems based on the pulse signal. A difference between the GPS speed and SPD pulse is detected. 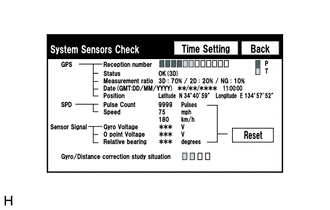 (a) Enter the "System Sensors Check" screen. Refer to Check GPS & Vehicle Sensors in Operation Check (See page ). The readings are equal or almost equal.